Acting on Impulse has attracted much media interest. The links and articles below show you a little more. Inspire magazine features Acting on Impulses latest film, ‘Penalty’. This has been described as a horror movie meets sci-fi. It was a very ambitious project set in a working hotel in Salford. It was premiered at Home arts and theatre complex in Manchester on 7th July, 2018. The film has been entered into a number of film festivals and has already won some awards. It will be available to view on line after the festivals have screened the film. We are grateful to the BBC Radio Manchester who interviewed one of our actors and the director of our latest film project, Garry Paton. Once again we appreciate their support of one of our amazing projects. Thanks to the BBC for the audio transcript of this interview. BBC Radio Manchester came along to the filming on the first day of our four day shoot of ‘Life’s a Lottery’. 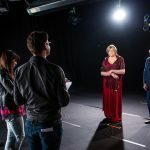 They interviewed the actors and crew members to find out just what the project had meant for those taking part. The piece was broadcast that evening. It was heard by the producers of BBC North West Tonight news and information programme. They sent along an interviewer and camera man to the 4th day of filming on location at the Cornerstone Day Centre. It was another chance to follow up some of the stories of our actors and to capture a little of the atmosphere of an Acting on Impulse filming project. There was a significant piece broadcast as part the the evening news programme that night. We are grateful to the BBC for their interest in our amazing work. Acting on Impulses latest film premiered at the new Manchester arts cinema and theatre complex, ‘Home’. This was the most ambitious project to date featuring 25 actors in a large ensemble piece. This was a feature length satirical film based in a reality TV show -‘The Box’. Manchester Evening News features Acting on Impulses latest filming project. Kavana, recently fresh from his experience in the Big Brother House, featured in the AOI film, ‘The Box’. The was a political satire based on a reality TV show. It was great to have his support – he was a natural! The Big Issue in the North features the making of ‘Street Life – one year on’ and the cameo appearances by Brooke Vincent and Amy Kelly from Coronation Street. Coronation Street stars appearance in Acting on Impulse’s, Street Life is featured in Digital Spy on line news 17 May, 2014. The on-line news channel has featured the story of Brooke Vincent’s (Sophie Webster) and Amy Kelly’s (Maddie Heath) appearance in Acting on Impulse’s latest film project, ‘Street Life – the Mockumentary’.